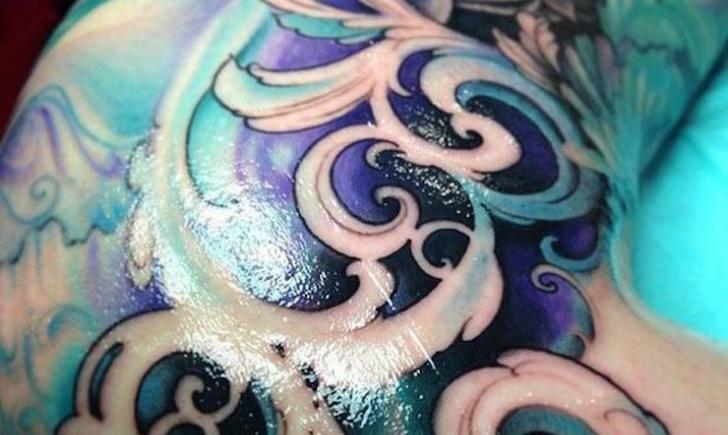 This very large side tattoo is elegant and beautifully colored in its blue and purple gradations. There is even a drop shadow to give it a subtle 3D effect. Gorgeous line work and subtle shading in this old school, traditional style tattoo using Victorian scrollwork as the basis for its design. A Victorian scrollwork tattoo design that truly accentuates this wearer’s body. Victorian scrollwork incorporated into a timepiece design. What a lovely concept. A simple scrollwork design on the hip of this tattoo enthusiast is perfectly placed. Here is a much larger side and thigh scrollwork tattoo, absolutely stunning! Look at the color incorporated into this beautiful negative scrollwork tattoo design! Wow! Skillfully shaded black and gray, flowing Victorian scrollwork design. Simply vertical, yet gorgeous scrollwork tattoo. Victorian scrollwork seems to be the perfect design basis for the side of the body, don’t you think? Another gorgeous side tattoo using Victorian scrollwork. Check out this Victorian scrollwork tattoo with many different colors playing into it? What an eye catching tattoo.